The VFW Teacher of the Year award contest recognizes three exceptional teachers for their outstanding commitment to teaching Americanism and patriotism to their students. 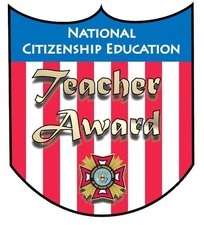 Each year, a classroom elementary, junior high and high school teacher whose curriculum focuses on citizenship education topics — for at least half of the school day in a classroom environment — can be nominated for the Smart/Maher VFW National Citizenship Education Teacher Award. Deadline Have entries to Post 2667 are closed for 2018-2019. Check back in the Spring of 2019 for next years program.